Show Bigotry the Red Card continues to deliver its successful anti-sectarianism initiative to grassroots football teams this season, thanks to funding from the Scottish Government. Building on previous success working with grassroots football teams across Scotland the education team, including the ex-professional footballers who work with the campaign, have visited various clubs to deliver a one hour interactive educational workshop highlighting the dangers of sectarianism and how we all have a role to play in safely challenging sectarianism. The workshop is followed by a one hour coaching session delivered by the campaigns ex-professional footballers promoting equality, respect and team work. 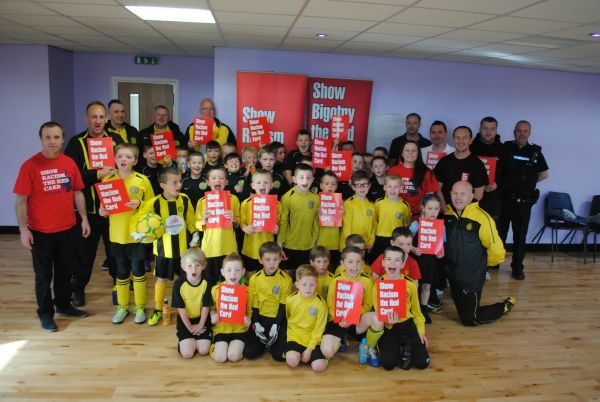 Show Bigotry the Red Card’s education team and ex-professional footballers Derek Ferguson and Michael Weir had an excellent evening at the Sir Matt Busby Centre in Bellshill with Mossend Boys Club on Friday 17th May 2013. The team worked with the clubs 2003 and 2004 teams who were so enthusiastic throughout the event. The club also involved many of their coaches in the event, as well as representatives from various external organisations. “It was a pleasure to work with such a proactive community club and we look forward to continuing to work with them. The enthusiasm from the young people and coaches we worked with was overwhelming and demonstrates a clear willingness to engage in anti-sectarianism education in a positive and unique manner. The club is a credit to grassroots football in Scotland. “The presence of ex-professional footballers like Derek Ferguson and Michael Weir at these events is invaluable in promoting positive messages. “Mossend BC feel that this is an excellent opportunity for the club, the boys and all taking part to send a real message out that racism and sectarianism have NO place in society and particularly in our area of sport. “Recently we have seen the escalation of racist incidents within the game culminating in court cases, lengthy bans for professional players, teams walking off pitches in reaction to racist chanting from the crowd, professional clubs being fined heavily for their fans behaviour – all totally unacceptable. “This is a chance to do something locally to send a clear message, we have to tackle this and it means tackling it at grassroots level, it means explaining to youngsters that there is no place for it. This initiative has been very well received by the young people and coaches the campaign has engaged with and we are inundated with clubs keen to get involved and promote the anti-racism and anti-sectarianism messages which highlight the value of this important initiative.